هویت یکی از پیچیده‌ترین مفاهیم در حوزه علوم انسانی و اجتماعی به شمار می‌رود؛ پدیده‌ای چندوجهی که از مناظر مختلف، مبانی و معانی گوناگونی را نمایان می‌سازد. در یک نگاه کلی می‌توان هویت را حاصل دیالکتیک نظام ذهنی و ساختار اجتماعی و فرهنگی قلمداد نمود؛ رویکردی که هویت را در کنار غیریت مورد توجه قرار داده و بدین سان واحد تحلیل خود و دیگری را در حوزه هویت برجسته می‌سازد؛ اما وقتی از هویت فرهنگی سخن می‌گوییم نسبت هویت با مفاهیم پیچیده‌ای چون فرهنگ و ملیت، کلافی درهم‌تنیده را پدیدار می‌سازد که مفهوم هویت را با رویکرد‌های نظری گوناگون مواجه می‌سازد. این معنا در مورد ایران از اهمیت والایی برخوردار است زیرا منابع هویتی ایرانی، اسلامی و غربی هرکدام در دوره‌ای و به نحوی در انباشت هویتی ایرانیان تأثیر گذاشته و هویت فرهنگی ایرانی معاصر را پدید آورده‌اند. در این راستا می‌توان دو رویکرد هویتی را در نظر گرفت: رویکرد توصیفی که ناظر به حال و گذشته است و رویکرد تجویزی یا سیاستی که ناظر به سیاست‌های هویتی است. 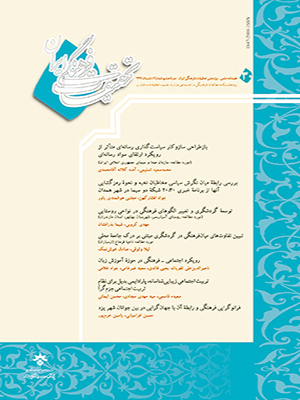 در رویکرد تجویزی، مؤلفه‌های هویتی مفاهیمی عام، انتزاعی و کلی هستند چراکه اساساً تغییر و تحول هویتی حرکتی تدریجی و البته آرام در نظر گرفته می‌شود. با لحاظ نمودن این مبنا در سیاست هویتی، می‌توان مؤلفه‌های اصلی هویت فرهنگی ایرانیان را در پنج حوزه تحلیل کرد: دیانت، زبان، جغرافیای فرهنگی، تاریخ و حافظه فرهنگی و نظام اجتماعی. Âlam, A. (1376 [1997 A.D]) Bonyâdhây-e Elm-e Siâsat (Persian Translation of The Principles of Politics), Tehrân: Našr-e Ney. Antadiyop, P. (1361 [1982 A.D]) “Hoviat Farhangi” (Persian Translation of Cultural Identity), Payâm-e Yoonesko, Vol.- ( 149):-. Aštariân, K. (under publication) Siâsat-e Hoviat: Melâkhâ va Meyâyhây-e Hoviat (Persian Translation of Identity Politics: The Principles of Identity), -: -. Bhugra, D., & Becker, M. (2005) “Migration, Cultural Bereavement and Cultural Identity”, World Psychiatry, Vol. 4 (-): 18-24. Birou, A. (1370 [1991 A.D]) Farhang Oloom-e Ejtemâee (Persian Translation of Vocabulaire pratique des sciences sociales), Transalted by Bâqer Sârooxâni, Tehrân: Moasese Keyhân. Brown, R. (1996) “Social Identity”, in A. Kuper and J. Kuper, The Social Science Encyclopedia, New York: Rouledge. Čalabi, M. (1375 [1996 A.D]) Jâmešenâsi Nazm (Persian Translation of Sociology of Order), Tehrân: Nšr-e Ney. Crang, M. (1998) Cultural Geography, London: Routledge. Dâvariardakâni, N. (1386 a [2007 A.D]) “Namâhây-e Hoviat-e Irâni va Zabân Fârsi” (Persian Translation of The Symbols of Iranian Identity and Persian Language), Faslnâmeh Motâeât Meli, Vol.- (30):-. (1386 b (2007 A.D]) “Siâsat-e Penhân-e Zabân dar Moqâbel Siâsat Âškâr ân” (Persian Translation of The Overt and Covert Politics of Language), Nâmeh Farhangestân, Vol.9 (1):-. Diamantopoulos, Adamantios, National Identity International Marketing Seminar www.unet.univie.ac.at /... / National % 20Identity %20- %20NATID.pdf, 2005. Edensor, T. (2002) National Identity, Popular Culture and Everyday Life, New York: Oxford. Erikson, E. (1994) Identity: Youth and Crisis, New York: Norton & Company. Eslâmi Nadoošan, M. (1370 [1991 A.D]) Jâm-e Jahânbin (Persian Translation of The World), Tehrân: Jâmi. Eytan, A., Petschen. N. J., Fabry. M. G. (2007) Bicultural Identity among Economical Migrants from Three South European Countries Living in Switzerland, Adaptation and Validation of a New Psychometric Instrument, BMC Psychiatry. Eslâmi Irân” (Persian Translation of Imam Khomeini: Cultural Identity and The Future of Islamic Republic), Faslnâmeh Pažooheš, Vol.- ( 22-23):-. Gerânpâyeh, B. (1377 [1998 A.D]) Jâmee va Farhang (Persian Translation of Society and Culture), Tehrân: Našr-e Šarif. Giddens, A. (1378 [1999 A.D]) Tajadod va Tašaxos (Persian Translation of Modernity and Self - Identity: Self and Society in the Late Modern Age), Translated by Nâser Movafaqiân, Tehrân: Našr-e Ney. (1984) The Constitution of Society: Outline of the Theory of Structuration, Cambridge: Polity. Hall, M. & Jackson, P. T. (2007) Civilizational Identity: The Production and reproduction of “Civilizations” in International Relations, New York: Palgrave Macmillan. Izotso, T. (1381 [2002 A.D]) Xodâ va Ensân dar Qorân (Persian Translation of God and Hu), Translated by Ahmad Ârâm, Tehrân: Sahâmi Enstešâr. Jacobson, (1993) Islam in Transition, London: Routledge. Jafariân, R. (1383 [2004 A.D]) “Massaleh Sonat va Tajadod va Tasir ân bar Hoviat Irâni” (Persian Translation of The Problem of Tradition and Modernity and The Effects of Iranian Identity), Goftârhâee darbâreh Hoviat Meli dar Irân, Tehrân: Moaseseh Motâleât Meli. Jordan, T., Rowentree, L. (1380 [2001 A.D]) Moqadamei bar Joqrâfiyây-e Farhangi (Persian Translation of The Human Mosaic: A Thematic Introduction to Cultural Geography), Transalted by Tavalâee & Soleymâni, Tehrân: Pažoohešâh farhang, Honar va Ertebâtât. Kačooiân, H. (1378 [1999 A.D]) Tatavorât Goftmânhây-e Hoviati-e Irân: Irân dar Kešâkeš bâ Tajadodo va Mâbad Tajadod (Persian Translation of The Evolution of Iranian Identity Discourses: Iran Between Modernity and Post Modernity), Tehrân: Našr-e Ney. Lotman Yuri; Shukman, A. (2001) Universe of the Mind: A Semiotic Theory of Culture, London: I. B. Tauris. Luckmann, T., Burger, P. (1375 [1996 A.D]) Sâxt-e Ejtemâee Vaqeiyat (Persian Translation of The Social Construction of Reality), Translated by Fariborz Majidi, Tehrân: Entešârât Elmi Farhangi. Translation of National Identity in Iran), Tehrân: Pažooheškadeh Oloom-e Ensâni va Motâleât Farhangi. Motahari, M. (1362 [1983 A.D]) Xadamât-e Motaqâbel Eslâm va Irân (Persian Translation of The Contributions of Islam and Iran), Qom: Entešâât Sadrâ. (1372 [1993 A.D]) Pirâmoom-e Enqelâb Eslâmi (Persian Translation of Islamic Revolution), Qom: Entešâât Sadrâ. Najafi, M. (1385 [2006 A.D]) Takvin va Takavvon-e Hoviat-e Meli –e Irâniân ( Persian Translaton of Evolution of Iranian National Identity), Tehrân: Pažoohešgâh Oloom-e Ensâni va Motâleât Farhangi. Nasr, H. (1380 [2001 A.D]) Marefat va Manaviat (Persian Translation of Knowledge and Spirituality), Tehrân: Daftar Pažooheš va Našr-e Sohrevardi. Rajâee, F. (1382 [2003 A.D]) Moškele Hoviat Irâniân-e Emrooz: Ifây-e Naqš dar Asr-e Yek Tamaddon va Čand Farhang (Persian Translation of The Problem of Contemporary Iranians` Identity: Role Making in the World of One Civilization and Few Cultures), Tehrân: Našr-e Ney. Ravâsâni, Š. ( 1380 [ 2001 A.D]) Zaminehây-e Ejtemâee Hoviat Meli (Persian Translations of The Social Context of National Identity), Tehrâ: Markaz-e Bâzšenâsi Eslâm va Irân. Rocher, G. (1376 [1997 A.D]) Jâmešenâsi Tâlgot Pârsonz (Persian Translation of Talcott Parsons and American Sociology), Transalted by Abdolhossein Nikgohar, Tehrân: Moaseseh Farhangi Entešârâti Tebyân. Rooholamini, M. (1379 [2000 A.D]) Zamineh Farhangšenâsi (Persian Translation of The Context of Culturology), Tehrân: Entešârât Attâr. Salimi, H. (1379 [2000 A.D]) Farhanggarâee, Jahânišodan va Hoqooq Bašar (Persian Translation of Culturalism, Globalization and Human Rights), Tehrân: Motâleât Siâsi va Beynolmelali. Šariati, A. (1379 [2000 A.D]) Bâzšenâsi Hoviat-e Irâni Eslâmi (Persian Translation of Understanding Iranian Islamic Identity), Tehrân: Entešârât Elhâm. Sariolqalam, M. (1383 a [2004 A.D]) “ Pârâdox-e Hoviat dar Irân: Taqâbol-e Liberâlism va Eslâm” (Persian Translation of The Paradox of Identity in Iran: Liberalism and Islam), in Aliakbar Alixâni, Hoviat dar Irân, Tehrân: Pažooheškadeh Oloom-e Ensâni va Ejtemâee Jahâd Dânešgâhi. (1383 b [2004 A.D]) Mafhoom Šenâsi Hoviat-e Meli (Persian Translation of The Concept of National Identity), in Dâvood Mirmohammadi, Goftârhâee darbâreh Hoviat-e Meli dar Irân, Tehrân:Moaseseh Motâleât Meli. Šayegân, D. (1380 [2001 A.D]) Afsoonzadegi-e Jadid: Hoviat Čehel Tekeh va Tafakor-e Sayyâr (Persian Translation of ), Translated by Fâtemeh Valiâni, Tehrân:Našr-e Pažoohesh Foroozân Rooz. (1381 [2002 A.D]) Bothây-e Zehni va Xâterey-e Azali (Persian Translation of Mental), Tehrân: Entešârât Amirkabir. (1383 [2004 A.D]) “Hoviathây-e Čandgâneh” (Persian Translation of The Plural Identities), in Aliakbar Alixâni, Hoviat va Bohrân Hoviat, Tehrân: Pažooheškadeh Oloom-e Ensâni va Ejtemâee Jahâd Dânešgâhi. Smith, Anthony D. (1991) National Identity, London: Penguine Books. Smith, F. (1383 [2004 A.D]) Darâmadi bar Nazariyeh Farhangi (Persian Translation of Cultural Theory: An Introduction), Translated by Hasan pooyân, Tehrân: Daftar-e Pažoohešhây-e Farhangi. Sorooš, A. (1377 [1998 A.D]) Râzdâni va Rošangari va Dindâri (Persian Translation of Secret Keeping, Intellectuality and Religiosity), Tehrân: Moaseseh Farhangi Serât. Taguchi, T. (2006) Welsh Nationalism and Cultural Identity Journal of Culture and Information Science, 1 (1), 1-7. Tavasoli, Ğ. (1383 [2004 A.D]) “ Tahlili az Andišeh Piyer Bordiyo darbâeh Fazây-e Monâzeeâmiz Ejtemâee va Naqš-e Jâmešenâsi (Persian Translation of The Analysis of Piere Bourdiou`s Thoughts), Nâme Oloom Ejtemâee, Vol.- ( 23):-. Vezzoni, C. (2007) Components of National Identity, Milan: University of Milan. Translation of Identity and The Discourses in Iran), in Alikakbar Alixâni, Hoviat dar Irân, Tehrân: Pažoohešadeh Motâleât Farhangi va Ejtemâee Jahâd Dânešgâhi.